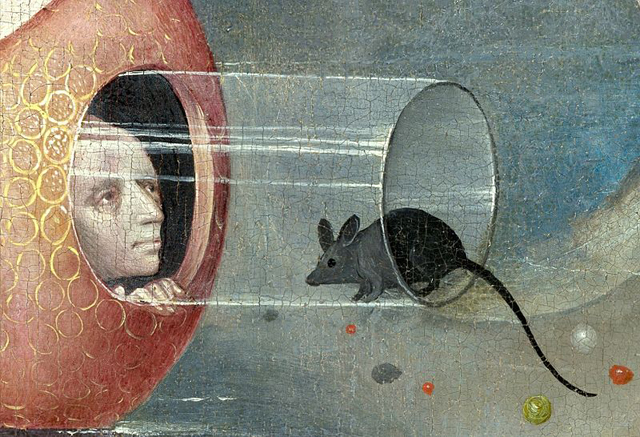 A recent study shows that mice can indeed have preferences to paintings, given the proper morphine reinforcement. 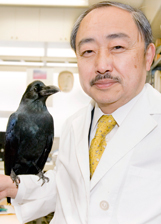 In a paper called “Preference for and Discrimination of Paintings by Mice” by Shigeru Watanabe, published on June 6 in the peer-reviewed journal PLOS ONE, the Japanese psychology professor pitted Renoir against Picasso and Kandinsky against Mondrian for critical rodent affection. In general mice did not display a painting preference except for two mice: one preferred Renoir to Picasso, and the other preferred Kandinsky to Mondrian. Thereafter, I examined discrimination of paintings with new mice. When exposure to paintings of one artist was associated with an injection of morphine (3.0 mg/kg), mice displayed conditioned preference for those paintings, showing discrimination of paintings by Renoir from those by Picasso, and paintings by Kandinsky from those by Mondrian after the conditioning. They also exhibited generalization of the preference to novel paintings of the artists. After conditioning with morphine for a set of paintings consisting of two artists, mice showed discrimination between two sets of paintings also from the two artists but not in association with morphine. These results suggest that mice can discriminate not only between an artist’s style but also among paintings of the same artist. Why bother with this rather whimsical research? Well, the idea that art and the appreciation of aesthetics is a human thing is one that Watanabe is confronting with these studies, where the cognition that something is beautiful or ugly, or “good” or “bad” with art can reflect sensory experiences in other species, as well as show that the experience of art is tied to the experience of pleasure. Given that some art just needs the right audience, maybe the mice would be more open to something sculptural or installation-based for their tactile little feet? Here’s hoping Watanabe continues his intriguing studies to make art critics of the animal world. Russian artist Wassily Kandinsky was a man whose abstract art made history in the 20th century and whose name continues to stump English speakers long after his death. The beloved painter and printmaker — celebrated with a Google Doodle today — would be blowing the candles out on his 148th year were he still alive today. In honor of Vah-SEEL-ee Kahn-DIN-skee’s big day, we’re collecting together some of the more interesting facts from his storied life and career. From his birth in Moscow, back when the Russian Empire was still in existence, to his death in France at the age of 77, here are the 9 things you might not have know about dear Vasya. 1. 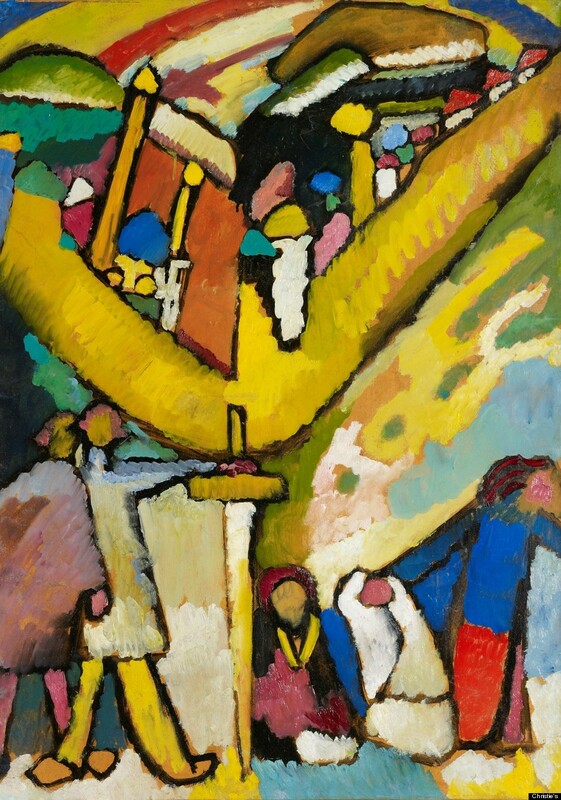 Kandinsky began seriously pursuing art when he was 30 years old. Which makes him somewhat of a late bloomer. In fact, he had previously been studying law and economics, but he opted to abandon the fields (and a professorship in jurisprudence at the University of Dorpat) in favor of studying painting in Germany. 2. He was an “average” student. Though his appearance, marked by pince-nez glasses and sharp suits, gave the impression of a formidable teacher, he was mostly an average art student. He studied for two years under Anton Ažbe, then for one year alone, before finally being accepted into the Munich Academy, showing a proclivity toward color theory. He received his diploma in his mid-thirties and enjoyed a few years of mid-level success as a professional artist thereafter. 5. He is credited with being the first artist to create a purely abstract work. It was an untitled watercolor, now in the Centre Pompidou in Paris. According to most historians, by the time he painted Composition VIII in 1923, all representational elements had been removed from his work. 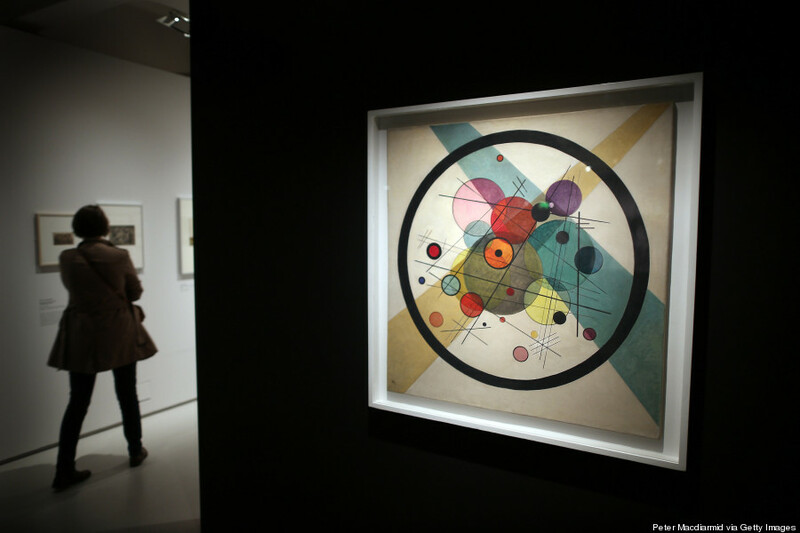 Francis Picabia and Piet Mondrian were exploring similar patterns in “pure abstraction” during this period as well. 6. Kandinsky allegedly had synesthesia. Synesthesia is defined as “the production of a sense impression relating to one sense or part of the body by stimulation of another sense or part of the body.” In essence, he would see colors when listening to music, which makes sense — given he also credits Richard Wagner’s “Lohengrin” as a reason for leaving law behind and chasing art. 7. He didn’t just love painting, he saw it as a form of worship. In Kandinsky’s book Concerning the Spiritual In Art (1910), the artist declared that “colour is a power which directly influences the soul.” He felt that the use of color was not merely a means of representing objects and forms, but rather a method of reaching a level of spirituality. 8. His art was confiscated by the Nazis before he died. While he was a Bauhaus professor, three of his first “Compositions” were seized by Nazis and put on display in the now infamous “Degenerate Art” exhibition in 1937. They were then destroyed. 9. His art now sells for millions and millions of dollars. His 1909 painting “Studie fur Improvisation 8” sold for $23 million at Christie’s in 2012. 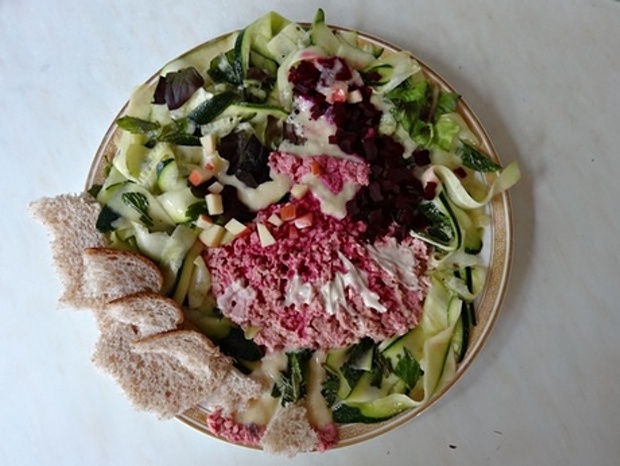 Inspired by Wassily Kandinsky’s “Painting Number 201” Franco-Columbian chef and one of the authors of the study, Charles Michel, designed a salad resembling the abstract artwork to explore how the presentation of food affects the dining experience. “A number of chefs now are realising that they are being judged by how their foods photograph – be it in the fancy cookbooks [or], more often than not, when diners instagram their friends,” explains Professor Charles Spence, experimental psychologist at the University of Oxford and a co-author of the study. 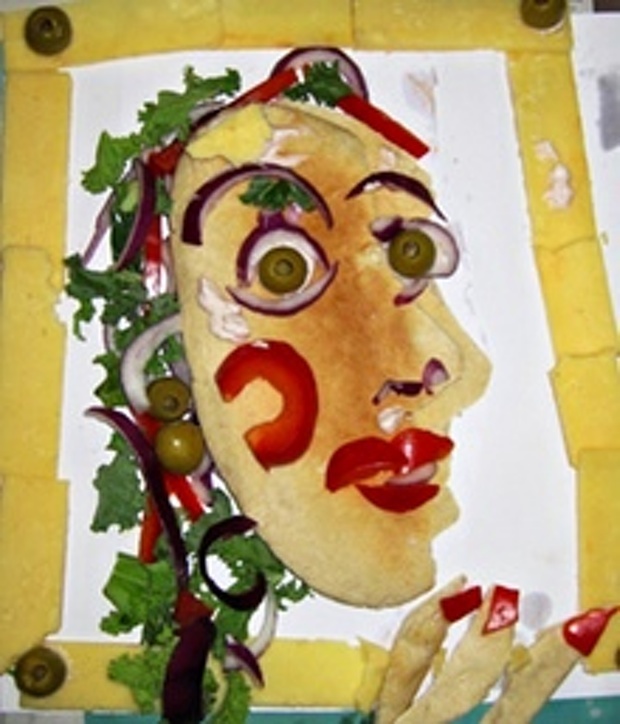 Thirty men and 30 women were each presented with one of three salads containing identical ingredients, arranged either to resemble the Kandinsky painting, a regular tossed salad, or a “neat” formation where each component was spaced away from the others. Seated alone at a table mimicking a restaurant setting, and unaware that other versions of the salad were on offer, each participant was given two questionnaires asking them to rate various aspects of the dish on a 10-point scale, before and after tucking into the salad. 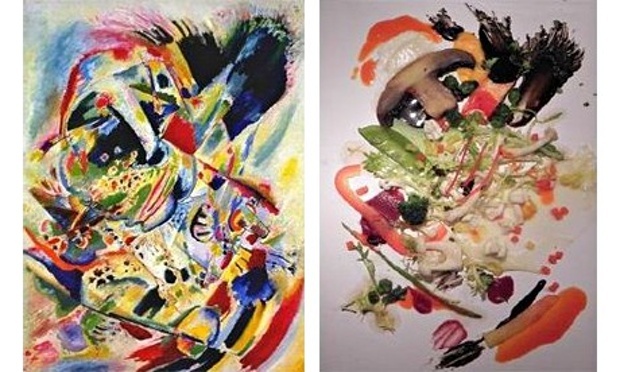 After polishing off a portion, participants also rated the Kandinsky-esque salad higher for “tastiness”, despite it receiving similar ratings to the other salads for the four basic components of taste: salty, bitter, sweet and sour. But teasing apart exactly which aspect of the salads’ presentation affected how much participants were willing to pay for a dish, and their perception of its “tastiness”, is a tricky business. The authors suggest that the perceived effort involved in preparing the plate and its aesthetic appeal could be among the factors influencing participants. Published in the journal Flavour, the authors believe the study adds to a growing body of evidence that the appearance and presentation of food can affect the dining experience. “[But] this is one of the very few studies that really used a full meal and in particular the only one that used a truly artful arrangement,” says Ohla.